If I told you how much my son loves pie, you wouldn’t believe it. I usually have to double the recipe because he could eat a whole pie by himself, maybe this should have been one of those times…. 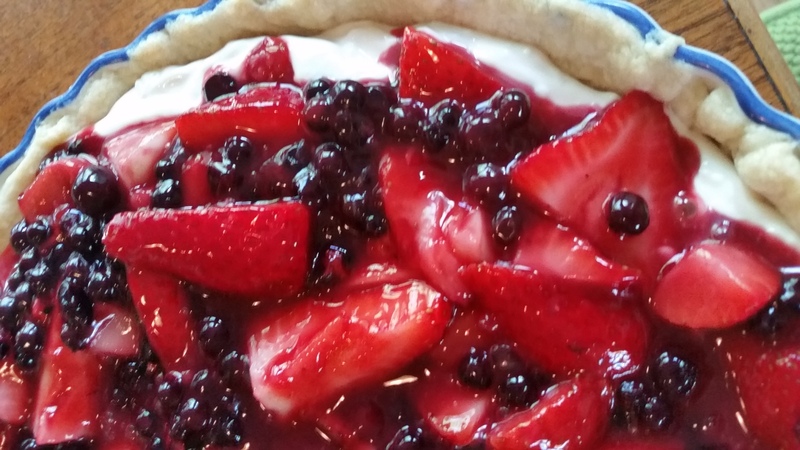 This easy, luscious and creamy no bake pie with fresh strawberries and blueberries will be perfect on your menu for the 4th of July. With it’s cheesecake like filling and juicy berries, it is a summer explosion in your mouth. I am so excited when it’s strawberry season, the recipe ideas are going wild in my head. This seemed like the perfect recipe. Not only is it a delicious pie, but it really is beautiful, with the bright colors of the berries! 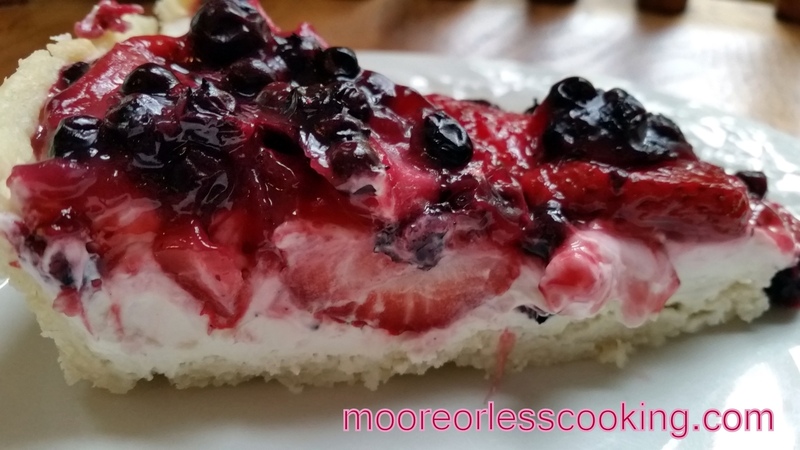 Mouthwatering sweet strawberries and Maine Blueberries with a cheesecake center over a flaky crust. Refrigerate for 2-3 hours so that the filling sets. 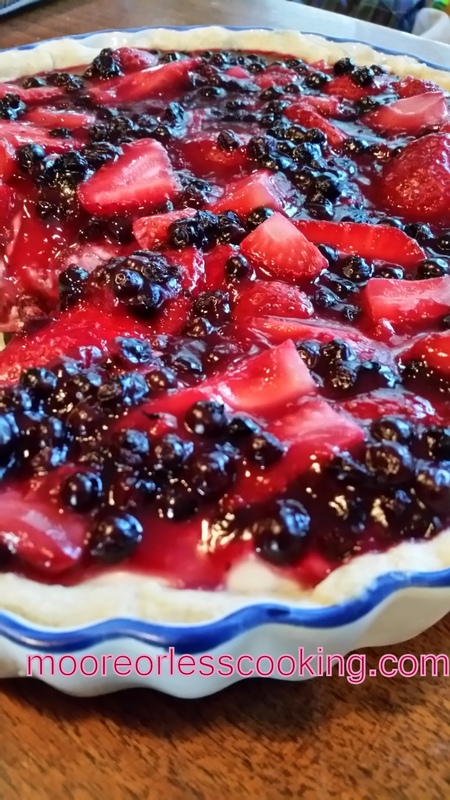 This easy No Bake Fresh Strawberry and blueberry pie is a favorite of my family's. Berries over cheesecake filling with a flaky crust! Incredible!! Cook pie crust according to package directions and cooled completely. Or make your own pie crust. Cut the other ½ pound of strawberries in half. In a medium sauce pan, combine ½ cup sugar, corn starch, lemon juice, chopped strawberries and blueberries.Cook over medium heat, stirring constantly until thickened. In a medium mixing bowl combine softened cream cheese, sour cream, remaining sugar and vanilla. Using a hand mixer or a whisk, beat mixture until completely combined and smooth. Spread cream cheese mixture into bottom of completely cooled pie crust. Add the largely chopped strawberries to the thickened strawberry and blueberry glaze mixture and stir gently until they are all coated and then pour that mixture over the cream cheese mixture in the pie crust and refrigerate for 2-3 hours or until ready to serve. I love a no bake pie because you can still have pie in the Summer without heating up the kitchen. Delicious recipe. Does anyone know if this would freeze well, want to make it ahead. What a delicious looking pie, Nettie, and I love that it is no bake! This looks wonderful! All my favorite flavors! Thanks for linking back to my recipe. Your blog is super cute. Glad you liked the pie.